Did you know the Bible contains hundreds of fulfilled prophecies made centuries in advance? And did you know that no other book in the world can make that claim? Britt Gillette didn't. At age 14, he found himself struggling with the universal questions of life. Questions such as: Who am I? What's the purpose of life? What happens when I die? And does God exist? So what did he find? He found the answers - every single one of them. And his life has never been the same. Most of all, you'll find that God really does care about you. 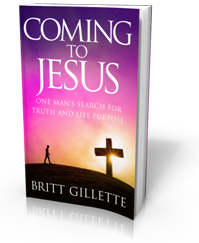 When Britt Gillette set out to find the truth, what he discovered changed his life forever. Maybe it will change yours too. Download the eBook Version for Free!